A few entries ago, I shared a tip for leveling your RV side to side when camping in the boondocks. Given the amount of interest in that entry, I will share another leveling tip for fifth wheel and travel trailer owners that involves front to rear leveling. When you’re logging long miles and pull off the road just to catch a few Z’s for the night, the last thing you want to do is take the time to unhitch, just to hitch back up to leave the next morning. One option is to raise the back end of the tow vehicle, which in turn may raise the front of your towable RV enough to obtain level. As a frugal RVer, I encounter this scenario quite often, as you take what you can get at free or low-cost campsites, like the boondocks, primitive campgrounds, or Walmart. Since you can orient your RV however you want in most instances, if faced with no level options, I will choose a campsite that leaves the nose of the RV low. I then take the leveling blocks I would normally use to level my trailer side to side and place them under the rear tires of my tow vehicle. Typically this raises the front of the trailer high enough that I can gain the additional lift I need to level the RV with the trailer’s tongue jack, and front stabilizing jacks foregoing the need to unhitch. Make sure to use blocks under your tongue jack and stabilizing jacks to avoid damaging the asphalt when camping at Walmart or other establishments that allow free overnight parking. Another advantage of staying hooked up is that the trailer has little front to rear rocking motion while hitched to the tow vehicle, eliminating the need to chock the wheels or install wheel locks, making your morning departure that much easier. Creative leveling, just another adventure in RVing! I did not see any suggestions on how to apply this technique to a fifth wheel trailer. I suppose you could use the fifth wheel jacks to lift the tow vehicle, but I have concerns about the load placed on the fifth wheel jacks. Same principle – raise the back of the truck via blocks get the fifth wheel level or “close” to level, then use the front jacks on the fifth wheel to stabilize or to finish the leveling job. 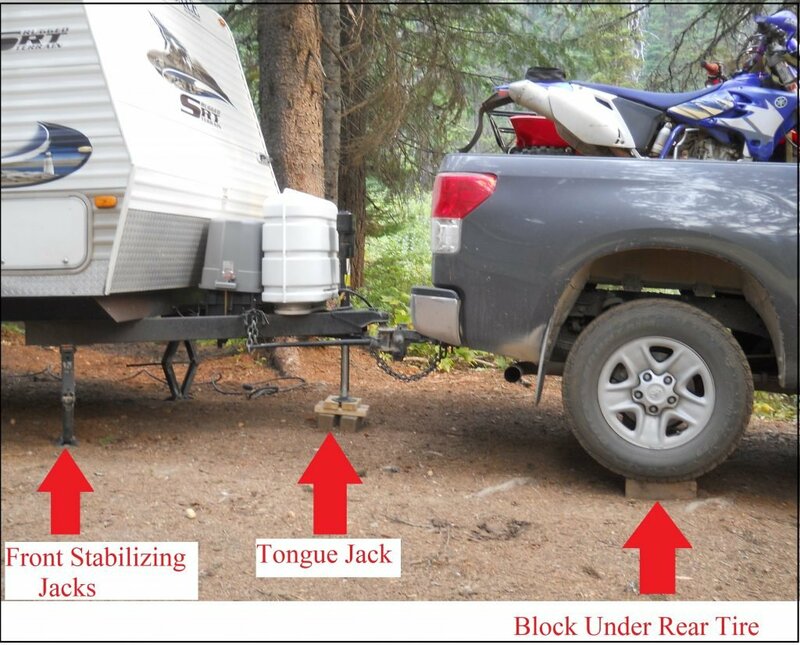 Remember using your jacks to raise the back of the truck is not lifting the truck, but rather unloading the weight of your fifth wheel from the truck’s suspension. I generally unhitch the trailer but leave my truck in place to adhere (mostly) to etiquette, then level as needed in any direction. Hitch back up in the morning and I’m on my way. I know, as with most things, these decisions are somewhat subjective, but the opinions of the experienced members help all of us. Thanks in advance! This is a great way to solve a problem for a tow vehicle which is lower than the RV. But due to a 3″ lift kit on my truck (before I bought it) I have the opposite problem. Seems I need to look for a campsite that raises (instead of lowers) the front of the RV. Thanks for the tips. in that case wouldn’t it be effective to put those blocks under the trailer wheels? We have a 5th wheel trailer and I guess I am lucky that mine travels very level between truck and trailer. The few times I have not unhitched I just put down the front jacks for stability and let it go at that. Stabilizing jacks are meant to stabilize, not lift the trailer. Damage could occur and may not be covered under a warrantee. Sounds like a good idea, but I would like to include using the tow vehicles (truck, suv etc…) emergency brake to keep everything steady.